Two weeks ago, we covered the TUI cruise fleet operated by the TUI Cruises joint venture with Royal Caribbean and the wholly-owned Hapag-Lloyd Cruises and Thomson Cruises. Today, we have a look at TUI’s expedition arm, with ships operated by Toronto-based Quark Expeditions and Seattle-based Zegrahm Expeditions. Emerald Waterways, meanwhile, are about to order three more 172-berth vessels for rivers they do not presently cruise on. And we have a quick look at the Duke and Duchess of Windsor’s cruise from Europe to Bermuda and Nassau seventy-five years ago this month. We continue now our coverage of TUI’s cruise operations with the expedition voyages operated by Quark Expeditions and Zegrahm Expeditions, part of TUI’s Adventure Specialist division. Zegrahm is celebrating its 25th Anniversary this year and Quark will next. 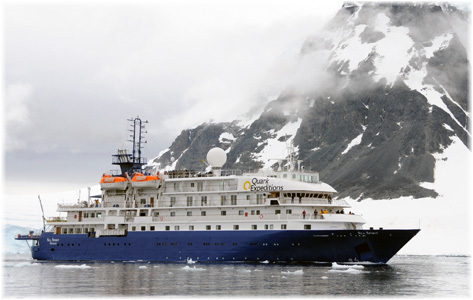 Quark Expeditions was formed in 1991 by Lars Wikander and Mike McDowell to specialise in expedition voyages to the Arctic and Antarctic aboard chartered Russian icebreakers and scientific research ships it adapted for passengers. The previous expedition leaders’ accommodation became suites, senior scientists’ cabins became en-suite accommodation and technician’s rooms became shared facilities cabins, with showers and toilets down the corridor. In August 1991, Quark completed the first ever commercial passenger transit of the Northern Searoute, sometimes called the Northeast Passage, connecting Europe and Asia over the northern seas of Russia. 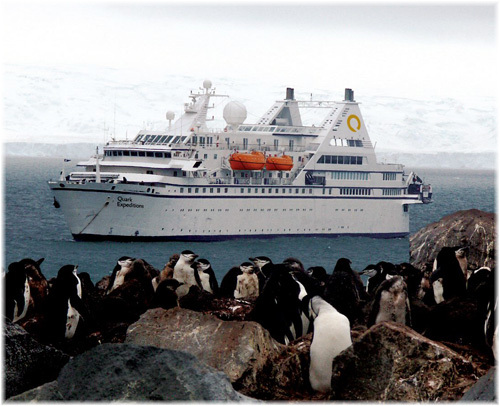 In 1997, it conducted the first-ever circumnavigation of Antarctica with passengers. It was also, along with Poseidon Expeditions, among the first to offer voyages to the North Pole in a nuclear icebreaker. In May 2007, Quark was purchased by UK-based TUI Travel and it now forms part of TUI Group’s Specialist and Activity section, along with other specialist travel companies such as Crystal Ski Holidays and adventure operator Exodus in the UK, TrekAmerica and Sawadee in the Benelux. Peregrine Adventures, which once operated two vessels on its own account, became a 60/40 joint venture of TUI with the Peak Adventure Travel group in 2011 but effective last month, it was announced that Peak would take sole ownership. Meanwhile, Zegrahm was formed in 1990 by seven founders, and for many years the 128-berth Oceanic Odyssey featured heavily in its programs. This vessel now operate s as Silverseas’ Silver Discoverer, but Zegrahm has now turned to a multi-ship strategy. As well as its traditional overland expeditions, Zegrahm is this year offering twenty small-ship cruises aboard eight vessels, the Caledonian Sky, Isabela II, Island Sky, La Estrella Amazonica, Oceanic Discoverer, Sea Adventurer, Sea Spirit and Variety Voyager. Zegrahm was acquired by TUI Travel in 2009. Quark doesn’t operate traditional cruise ships but mostly small expedition ships or polar adventure ships with ice-strengthened hulls. Like most of those used by Zegrahm, these are nimble vessels, carrying fewer than 200, and equipped with Zodiacs for landing from ship to shore. 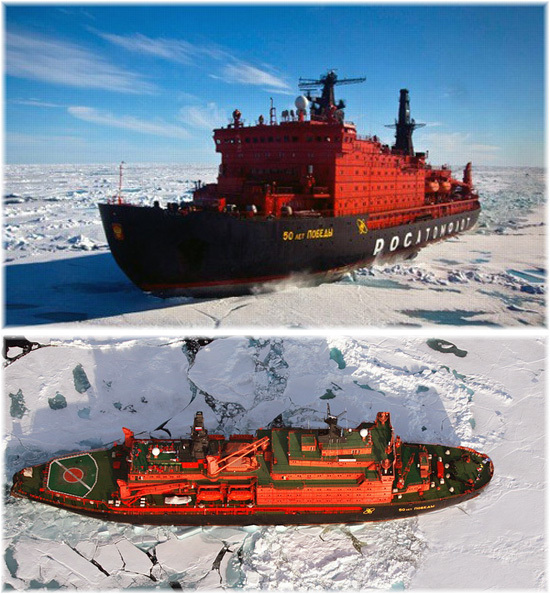 Originally, Quark used vessels like the Russian icebreakers Kapitan Khlebnikov and Kapitan Dranitsyn, together with scientific research ships of the 110-berth Akademik class and 52-berth Professor class. For its North Pole program it has always used a nuclear icebreaker, at first the Yamal and now the 50 Years of Victory, the most powerful icebreaker with the highest ice rating in the world. She is also equipped with a helicopter for aerial sightseeing. Over recent years, however, Quark has redelivered most of the Russian ships it used previously and today charters much of its tonnage from ship manager Fleetpro Ocean of Miami. These ships are better equipped for passengers and somewhat more luxurious than the Russian charters used previously. Today’s Quark fleet includes the 128-berth nuclear icebreaker 50 Years of Victory, the 102-berth conventional icebreaker Kapitan Khlebnikov, which has recently returned to commercial service. From Fleetpro, it charters five ice-strengthened passenger ships, the 198-berth Ocean Endeavour (ex-Kristina Regina), 189-berth Ocean Diamond (ex-Song of Flower), and 78-berth Ocean Nova, acquired from the Greenland trade, plus the 117-berth Sea Adventurer (ex-Clipper Adventurer) and 111-berth Sea Explorer (ex-Corinthian II). What is interesting about these operations is that ships are just chartered as needed for seasonal operations, while “out of season” they are chartered to other operators. 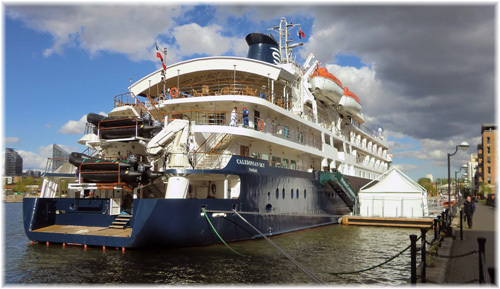 In the summertime, for example, the Ocean Endeavour is chartered by Adventure Canada for cruising in eastern Canada and the Canadian Arctic, while the Ocean Diamond is chartered by Iceland ProCruises for cruises around Iceland. Emerald Waterways is to build three more ships for delivery in 2017. At the christening of the line’s new Emerald Dawn and Emerald Sun in Budapest last week, owner Glen Moroney announced that the new vessels would sail on rivers where the line does not currently sail. The new ships will be identical to the fleet’s current 172-berth vessels, with four grades of accommodation. This will bring the number of ships in the Emerald fleet to eight, with Emerald Belle set for delivery in 2016. The line, which started service only two years ago with the Emerald Sky and Emerald Star, has been doing particularly well in the British market, which now produces about a quarter of its passengers, with a third coming from Australia and New Zealand and the balance mainly from North America and other English-speaking areas. The line appeals to young any travellers looking for moderately priced, all-inclusive river journeys. 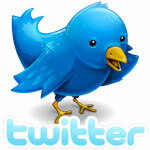 Fares include gratuities, shore excursions and beer, wine and soft drinks at lunch and dinner. 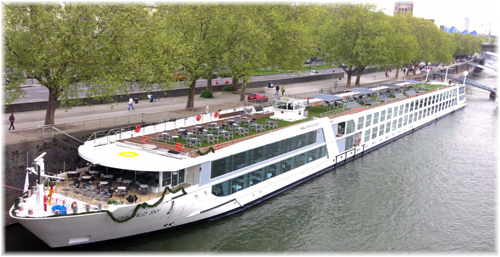 Emerald’s parent company is Scenic, the Australian operator, which operates its own brand of all-inclusive upmarket river cruises with butler service included. Seventy-five years ago, as Europe was succumbing to war, the Duke of Windsor, the abdicated King Edward VIII, was appointed Governor of the Bahamas. He and the Duchess were sent to Nassau, where they would remain for the duration of the war. 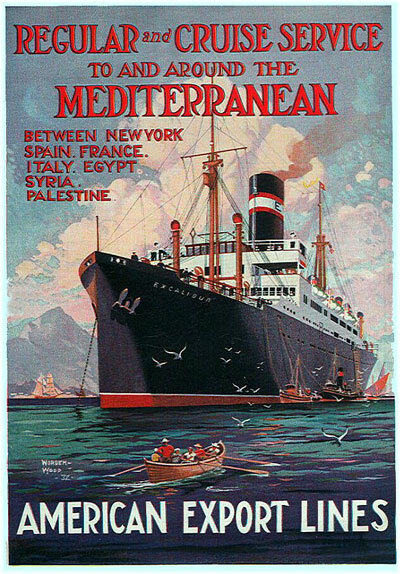 Not being able to embark on a belligerent ship in neutral Portugal, where the Windsors had made their way from Paris, the Windsors boarded a neutral American ship, American Export Lines’ 9,359-ton Excalibur. 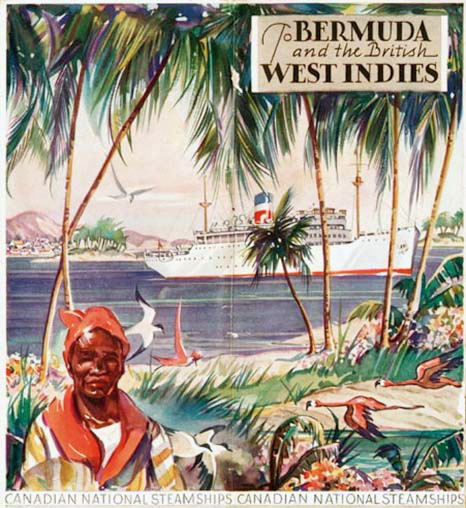 They sailed from Lisbon on August 1, 1940, bound for Bermuda. This was not one of her regular calls but had been conveniently arranged by the British government. After an 8-night crossing, on August 9 the Windsors arrived in Bermuda, where they spent some time as guests of the Governor. During their stay, the Duke inspected Canadian soldiers brought in to relieve the British garrison. One of the ships bringing the Canadian troops was the Clarke Steamship Company’s 3,445-ton New Northland, an occasional caller on spring and autumn cruises, which normally ran between Miami and Nassau each winter. On August 14, the Windsors departed for the Bahamas in Canadian National Steamships’ 8,194-ton Lady Somers, now painted grey instead of tropical white. After a further three-night voyage, they arrived in Nassau, escorted by the cruiser HMS Despatch, on August 17, where they landed that morning. “The Duke & Duchess of Windsor walked slowly down the gangplank of the Canadian liner Lady Somers to meet a welcoming roar from thousands of Bahamians jam-packed around the pier. The Duke of Windsor was sworn in as Governor of the Bahamas. Eastern’s 6,811-ton Acadia had been leaving New York every Saturday for Nassau all summer, and had just sailed a few hours before the Lady Somers arrived. Fifty days after she dropped the Windsors at Nassau, Ottawa requisitioned the Lady Somers for bareboat charter to the Admiralty as an ocean boarding vessel. Assigned to contraband control in the Bay of Biscay, she was torpedoed west of Gibraltar on July 15, 1941, by the Italian submarine Morosini, based in Bordeaux, luckily without loss of life. The Windsors would stay five years in Nassau and when they left in May 1945 it would be on another Canadian ship, headed for Miami and return to Europe via New York.